With the acquisition of Whole Foods Market in 2017 and an ongoing partnership with one of Britain’s biggest supermarkets, Morrisons, Amazon has gained even more insights into how their customers shop. It's also provided Amazon’s grocery services with a significant competitive advantage and a boost in brand recognition. Customers often cite a lack of product selection, quality, and freshness as the main reasons for not purchasing groceries online. Amazon is overcoming these barriers by offering a multitude of fresh, frozen, and packaged grocery products that can be tried and tested at neighborhood brick-and-mortar locations. Once a customer is familiar with an item, they can opt for the convenience of online purchase and delivery instead of making the purchase in-person. A recent 2018 study by the Retail Feedback Group found that half of US online shoppers plan to purchase grocery items online more often in the coming year and rate their overall satisfaction ordering food and grocery items online highest with Amazon. So, how has Amazon improved the online grocery experience? 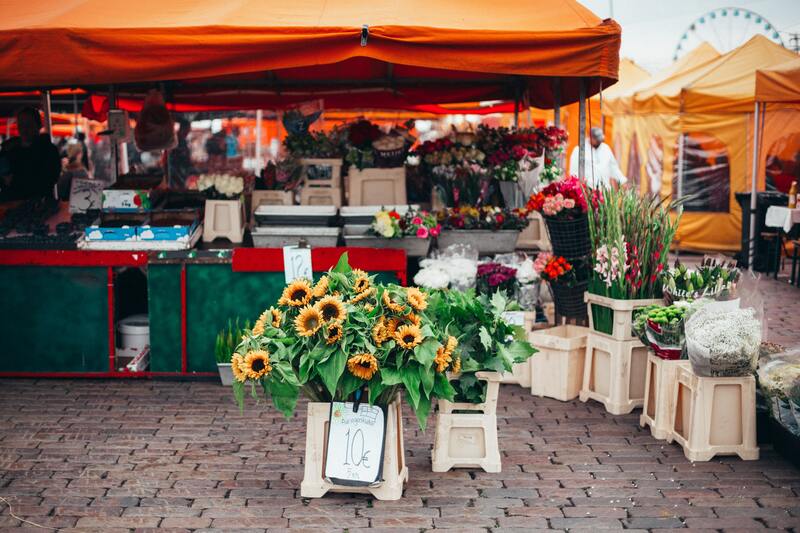 How do food sellers and suppliers take advantage of this growing market? Amazon purchased Whole Foods Market in mid-2017, which added 440 physical stores in the US, Canada, and the UK to its e-commerce assets. As Amazon has taken control over the past year and a half, the most significant change happened behind the scenes. Amazon centralized the purchasing structure and store practices for all Whole Foods locations. They moved the decision-making process, which was previously handled at a local level, to Whole Foods main headquarters. Brand representatives are no longer allowed to visit stores to promote products or check up on how things are stocked and displayed. 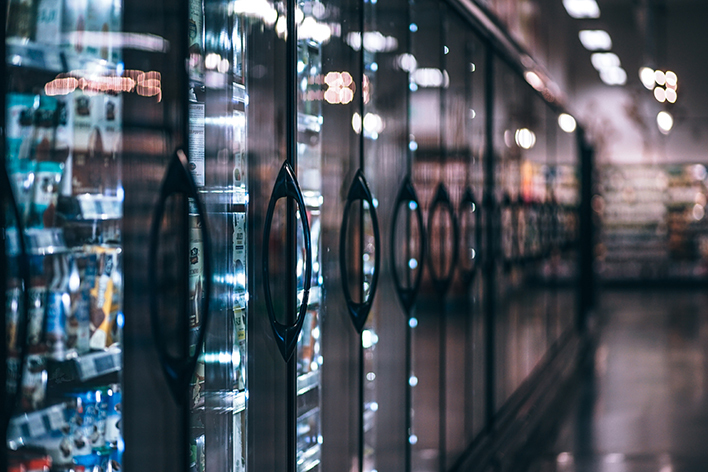 This change has resulted in a more unified brand atmosphere in stores and has streamlined the grocery shopping experience for customers online. While some customers were worried that Whole Foods would lose its local and organic brand promise, so far not much has changed except slightly lower prices. Shoppers can still find plenty of natural products bearing the “local” tag in each store. Amazon’s influence can be seen in some of the product additions. In some Whole Foods locations, shoppers can purchase Echo and Kindle devices, and pick up or return their voice and online purchases at Amazon storage lockers on site. There are also signs throughout the store promoting special savings for Prime members and 5% cash back for those purchasing groceries with their Prime Visa card. With more than 60% of Whole Foods shoppers already signed up as Prime members, this gives Amazon an instant (and huge!) brick-and-mortar presence to compete with major US-retailers: Walmart, Kroger, and Target. And, of course, there’s the bevy of Whole Foods’ goods and 365 Everyday Value products now available for purchase online through Prime Pantry; the produce, meat, and prepared food options added to AmazonFresh; and Prime Now. Let’s take a closer look at Amazon’s online grocery options. Amazon first rolled out Prime Pantry to select US cities in 2014. Marketed as "everyday essentials in everyday sizes, just one box away,” the service gave Prime customers the ability to order as many canned foods, cereal, snacks, beverages, and household items as could fit in a four-cubic-foot box up to 45 pounds – all delivered for a flat $5.99 fee. Today, Prime Pantry is available in the contiguous United States, the United Kingdom, Germany, Austria, India, Japan, Italy, Spain, and France. Customers can still get the box delivered for a flat fee; however, Amazon entices shoppers to add on a monthly Prime Pantry membership fee for special deals and offers, and free shipping on orders above a specified minimum amount (which varies by country). One to four business days later, a box filled with groceries arrives on a customer’s doorstep. Due to longer shipping times, Prime Pantry isn’t always the best option for last-minute necessities. It is popular among college students, especially those without cars, as Prime Pantry delivers to campus post offices while AmazonFresh does not. Prime Pantry allows students with Prime memberships access to an exciting array of dorm-friendly food options. Customers also find it useful to restock on staples, replacing their weekly trips to Target or Walmart. The top five Amazon Prime Pantry US searches on MerchantWords earlier this month were water, peanut butter, kleenex tissues, almond butter, and bbq sauce. Pro-Tip: Filter MerchantWords’ search results by category to learn what people are searching for on Prime Pantry. Prime Pantry provides the convenience of choosing from well-known brands (365 Everyday Value, Tide, Cheerios, etc.) from the comfort of home. This service is only available to Amazon Prime members. Unlike Prime Pantry, Amazon Fresh focuses on perishable foods like produce, dairy, meat, and seafood. 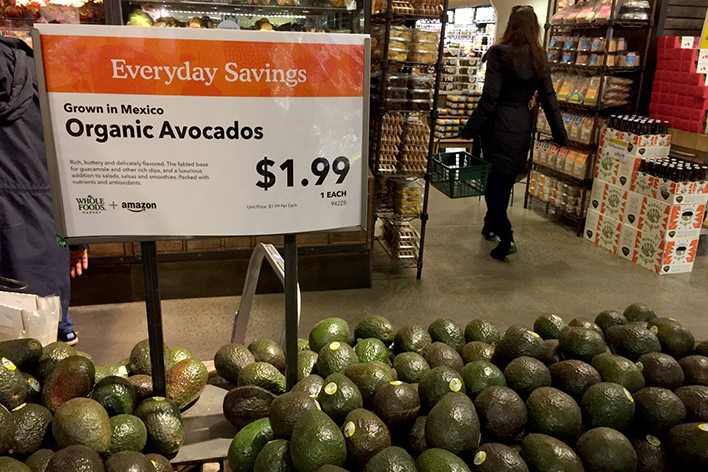 Launched initially as a beta program in select cities in early 2007, AmazonFresh had many fits and starts over the years before finally picking up momentum again in 2017. The service is now available in some US states, London, Tokyo, Berlin, Hamburg, and Munich. Amazon Fresh has benefited the most from the acquisition of Whole Foods Market and its partnership with UK grocery chain, Morrisons. These business decisions have allowed Amazon to significantly increase the quantity and quality of products it offers, and made it easier to fulfill orders quickly and efficiently. Like Prime Pantry, Amazon Fresh is also only available to Prime members. Customers can choose to pay a monthly subscription or flat delivery fee. Depending on your area, shipping can be free when the order total exceeds an established amount. For example, customers in Dallas, Texas, and Denver, Colorado get free shipping for a minimum purchase of $35. Earlier this month, the top searched items on Amazon Fresh US were ice cream, milk, chicken, bread, and fruit. With a close to 500 ice cream products available, it’s easy to see why this sweet treat made the top of the list. With supermarket chains like Whole Foods helping expand the selection of food options available to customers, Amazon is focused on improving the grocery delivery process. They’ve added a new option: attended delivery! Attended delivery is when a customer selects a one-hour period for their grocery delivery. Amazon then delivers the order in person to the customer or a trusted representative, like a doorman. This option helps ease concerns of theft and spoiling food, and makes it easier for customers with busy schedules to guarantee their deliveries. For customers who can pick up their own groceries but need them right away, there is also Prime Now. Prime Now has been around since 2014 and has greatly expanded its offerings and reach in the last few years. With Prime Now, Amazon Prime members in parts of the United States, United Kingdom, France, Germany, India, Italy, Japan, and Spain can place orders for fast same-day delivery. Through the Prime Now app or online, customers can shop for fresh and organic produce, bakery, dairy, meat, seafood, floral and daily essentials. These can either be delivered or customers can pick them up at a local Whole Foods or participating regional supermarket. Two-hour delivery is free on orders of $35 (£40) or more for Prime members, while one-hour delivery costs a flat fee. Customers park in a designated pickup spot, and a Prime Now personal shopper puts the groceries into their car. How do these developments affect sellers? Amazon does a great job offering shoppers greater value, convenience, and customization for their shopping experience. As Amazon continues to expand its reach in the grocery business, it provides sellers and suppliers access to a broader customer base by moving their gourmet, grocery, or household items online. Sellers can reach a wide array of individuals and businesses outside of their immediate network without the logistical hassle. 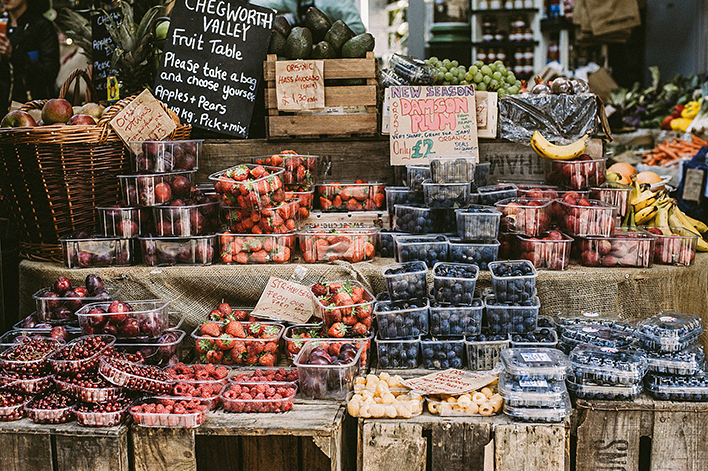 A common problem faced by sellers of perishable foods is an inability to distribute food to customers quickly. For all food providers, quick distribution and a built-in customer base can be extremely beneficial, but this is especially the case during the growing season when urban and rural farms are harvesting crops more quickly than they can sell them. Amazon’s network of stores and warehouses provides the opportunity to distribute food across regions at a much faster pace and can lessen fulfillment and transportation costs. With Prime Pantry and Amazon Fresh, small gourmet sellers and farms can move their sales from local farmer’s markets to online shopping carts; and large brands have the ability to get their products delivered to customer’s homes every week. Interested professional sellers must meet key performance targets to be considered for the Grocery and Gourmet Food category. Order Defect Rate (ODR): Amazon requires that this metric be less than 1%. Your ODR is calculated by taking the number of orders with a defect and dividing it by your total number of orders. Pre-fulfillment Cancel Rate: Sellers should maintain a pre-fulfillment cancel rate of less than 2.5%. This the number of orders canceled by a seller prior to ship-confirmation, divided by the number of orders in the time period of interest. Late Shipment Rate (LSR): Sellers must maintain an LSR below 4%. The Late Shipment Rate represents orders ship-confirmed after the expected ship date as a percentage of total orders, over both a 10-day or a 30-day period. LSR only applies to seller-fulfilled orders. Vendors should have a current GFSI Certification; otherwise, an Amazon Food Safety audit must be conducted. Products made in the USA should be produced in FDA- or USDA-licensed and approved commercial manufacturing facilities. Products made outside the USA should be produced in commercial manufacturing facilities that follow FDA or USDA regulations. Refrigerated food, frozen food, and raw agricultural commodities must be enclosed and sealed in packaging suitable for shipping. Packaging must keep temperatures safe for the product throughout delivery. You must have a Professional Seller Account. Products must have a unique UPC for each variation/product. Products should have e-commerce friendly packaging. Meat, Seafood, and/or Prepared Food items must be available pre-packaged and by net weight. All vendors must be prepared to provide product liability insurance. Amazon Fresh accepts applications from both small and large sellers and suppliers. Don’t be intimidated if you currently only sell locally or you have an innovative product that you haven’t brought to market yet! With so much growth happening and the competition for online grocery delivery as fierce as ever, what is Amazon doing next? 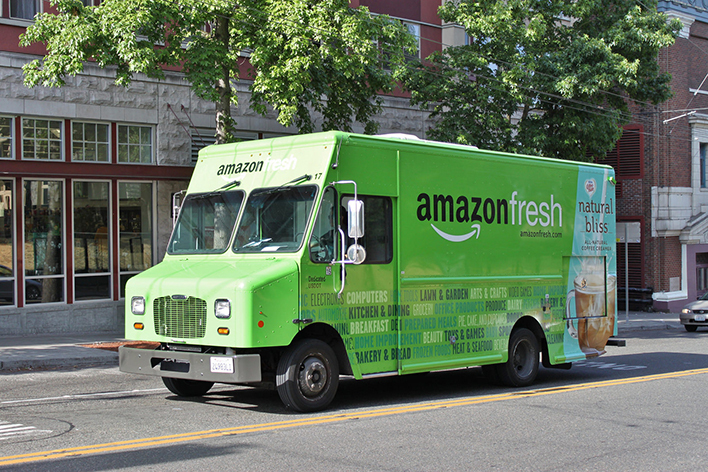 Amazon Fresh is continuing to expand into more cities and other marketplaces! The latest marketplace Amazon is eyeing is Australia. Amazon is also offering food pickup points, otherwise known as Amazon Fresh Pickup. Here’s how it works. A customer chooses their groceries online, selects a time to pick them up, and then arrives at the pickup point. Amazon can have the order ready for the customer in as little as thirty minutes. A customer can pick up their order or opt to have an Amazon crew member load the groceries directly into their car. After testing the service in locations near its headquarters in Seattle, Washington for 18 months, Amazon added more grocery pickup options to Whole Foods locations in California and Virginia this year. It has more locations planned in 2019. While this isn’t the sexiest of Amazon’s innovations, it could be the most scalable. With a growing supply chain and increased number of brick-and-mortar locations, Amazon could easily move this experiment throughout the United States and other countries. It’s likely that Amazon would expand to areas already eligible for PrimeNow since the infrastructure for quickly fulfilling orders already exists. Amazon has recently introduced Subscription and Discovery boxes. Customers can choose from several options, and new options are available each month. Currently, there’s everything from a selection of snacks to coffee. Sellers can use this as an opportunity to introduce new products and reach niche customers. Amazon made headlines when it introduced these stores without cashiers! Using sensors and technology, shoppers are able to scan in with their Amazon app, shop, and leave. Amazon charges your account and sends you a receipt. Amazon is introducing food is at their new Amazon Go stores in Seattle, Chicago, and San Francisco. Customers can choose from ready-made breakfast, lunch, and dinner options, and a selection of pantry staples. Amazon has said that the stores are supplied by local kitchens and bakeries; however, it’s likely that Amazon is sourcing from local Whole Foods locations to fill their shelves. According to one expert, Amazon is primed and ready to take the grocery industry by storm. Are you going to be a part of it? Amazon Fresh and most Amazon marketplaces are open to professional sellers of any size. Currently, half of Amazon sales come from small and medium businesses who compete for the same dollars as big brands and large corporations. Will this distribution change as Amazon, continues to disrupt the retail industry, and more brands come on board? We’ll look into the impact of this our blog post next week!